This is the second post in my series on finding my Irish roots. 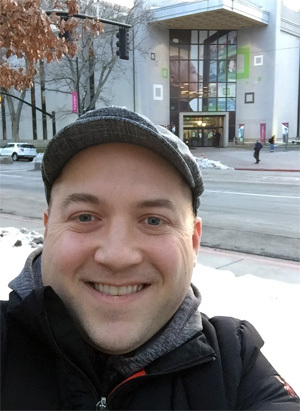 In the first post, I briefly introduced this blog series and talked about my goal of finding exactly where in Ireland my ancestors lived before coming to America. With my goal defined, this post will provide some of the background information, create an initial research question, and lay out some initial steps for my research. Based on firsthand knowledge and confirmed by vital records and DNA testing, my paternal great grandfather was James McDermott. James was born in 1880 in New York City to John McDermott and Annie Scanlon1. James was the youngest of three kids. He married Margaret Connolly in 19212 and died in 19553 . John Jr. was the middle child, born in 1878 in Newark, NJ4 . He married Mary Holmes in 19075 and died in 19366 . Catherine was the oldest, born in 1872 in Newark, NJ7 . She married Bernard Conlon in 18988 and died in 19559 . State and Federal censuses along with city directories told me the family lived most of their lives in Newark, New Jersey, with a quick stint across the Hudson River in New York City sometime between 1878-188010. That explains why James was born in New York City instead of Newark. My goal was to learn more about James’ father John, where he came from and who his parents were. Father of Catherine, John Jr, and James. Also possibly a fourth child who died as an infant. Missing from 1900 census. His wife Annie is widowed in the 1910 census. Unknown date and place. Presumably sometime between 1900-1910 in the New York metro area. 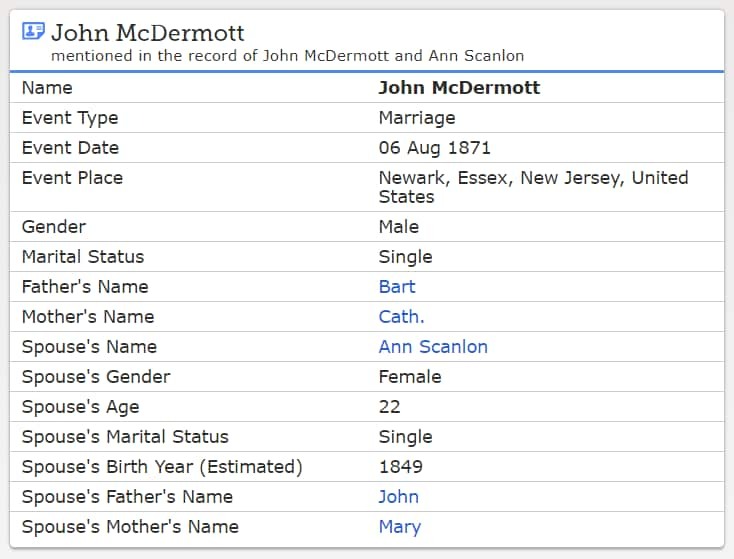 So my first (and primary) research question was, who were the parents of John McDermott who was born in Ireland, married Annie Scanlon, and was the father of James McDermott? My first task was to find the original marriage record of John and Annie since I knew there’d be a good chance that John’s parents would be listed. That’s the focus of this post. I knew the 1900 census had a column for the number of years married, so I wanted to start there. Annie was living with her two sons in Newark11 . Her oldest child Catherine married in 1897 so it makes sense she wasn’t living in the household. 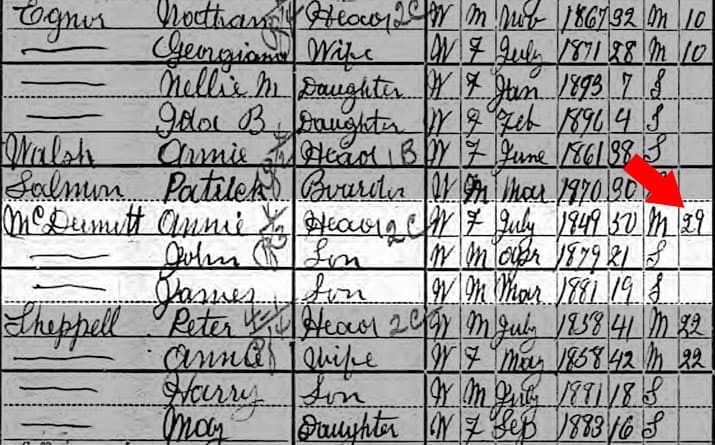 The census said Annie was married (and has been for 29 years), however, John was not listed in the household – a mystery for another day. All of the details for James and his older brother John were consistent with my known information. I went with the assumption that Annie’s 29 years of marriage in 1900 was her only marriage. It was a pretty safe assumption given that Catherine (the oldest known child) was born ca. 1872. These two sources combined told me the couple likely married sometime ca. 1871. I started with a broad search on FamilySearch with just the names of these parents to hopefully find a marriage record. But it was just an abstracted record of an original and may contain errors and/or omit important information. So I wanted to find the original. FamilySearch had a digital image of the original available, but wasn’t available to the public. A quick trip to my local Family Search Center to get access to the image yielded a positive result! Aug 7 John McDermott (27) & Ann Scanlon (22), both single, residing in Newark, married in Newark by T Killeen, groom’s parents Bart & Cath, bride’s parents John & Mary, groom’s occupation is a shoemaker. There was a lot of great information in this record, however, it was likely a derivative of an original Church record. I wanted to find that instead. There were no Church records indexed on FamilySearch for this marriage, so I had to dig deeper. It was possible the record was on FamilySearch, but not indexed and therefore would not return in search results. So I searched on Ancestry for city directories around this time and looked at all the Churches starting with the Catholic ones (since that was the most likely denomination). I was hoping to find a “T Killeen” at one of the Churches. Now that I knew the name of the Church where the marriage took place, I could try to find the original records. August 6th, 1871: John McDermott, 27 years, born in [County] Leitrim, of Bartholomew & Catherine Gahan, to Ann Scanlon, 22 years, born in Manchester, of John & Mary Brennan. Witnesses Terence McLaughlin & Mary Kavanagh. As expected, the marriage record listed John’s parents as Bartholomew & Catherine Gahan13. Even better, it also told me the county in Ireland where John was born! I now had some great clues to look for John’s baptism record in Ireland. John was 27 years old in 1871 which put his birth year ca. 1844. Ann was 22 which put her birth year ca. 1849. Both of these birth years were consistent with census records. Now that I knew both sets of parents, I could assume that John and Annie’s first child Catherine was named after John’s mother. Their first boy John was likely named after Annie’s father. This would have been a standard naming convention for the Irish during this time. But who was James named after? Annie’s birthplace is listed as Manchester which presumably refers to Manchester, England. This was consistent with census records for Annie which said she was born in England to Irish parents. Lastly, the marriage was witnessed by Terence McLaughlin and Mary Kavanagh. These two names didn’t ring any bells, so I added them to my FAN club, and created a new research question to figure out the relationship. I now had sufficient evidence without any conflicts, to conclude that this marriage record was for the correct John and Annie and that John’s parent’s names were likely Bartholomew McDermott and Catherine Gahan. Who were the parents of John McDermott who was born in Ireland, married Annie Scanlon, and was the father of James McDermott? When and where did John McDermott Sr. die? Where was he in the 1900 census? Who were Terence McLaughlin and Mary Kavanagh, who witnessed the marriage of John McDermot and Annie Scanlon in 1871 in Newark? Where and when was John McDermott (son of Bartholomew and Catherine Gahan) born? 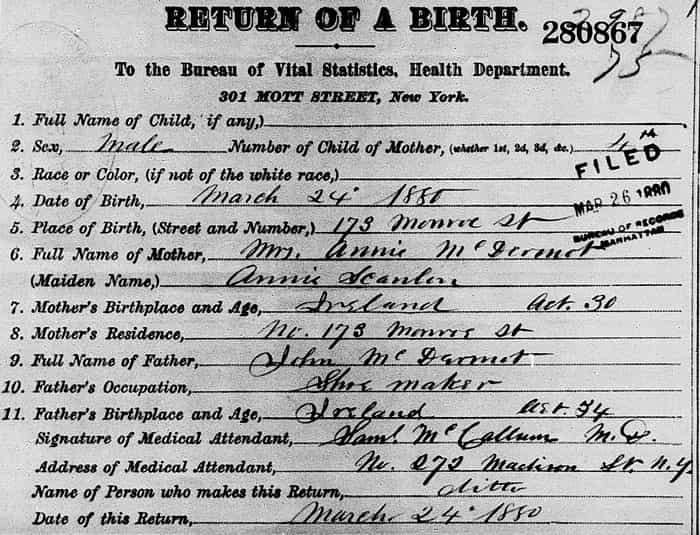 New York, New York, Birth certificates 1880, 280,867, unnamed McDermott, 24 March 1880; Database with images, FamilySearch (https://www.familysearch.org/ark:/61903/1:1:271X-ZZ4 : accessed 19 February 2018); citing New York Municipal Archives; FHL microfilm 1,322,152. New Jersey, Bureau of Vital Statistics, marriage certificate 538 (22 June 1921), James Aloysius McDermott and Margaret Mary Connelly; State Archives, Trenton. New Jersey, State Department of Health, death certificate 16,149 (1955), James Aloysius McDermott; State Archives, Trenton. Saint Patrick’s Pro-Cathedral (Newark), Baptisms, marriages 1850-1885, 29 April 1878, Morris McDermott; digital images, FamilySearch (https://www.familysearch.org/search/catalog/217358 : accessed 29 January 2019); citing FHL microfilm 1,398,552. New Jersey marriage certificate 216, (9 April 1907), John McDermott and Mary Agnes Holmes. New Jersey, State Department of Health, death certificate 896 (5 February 1936), John McDermott; State Archives, Trenton. Saint Patrick’s Pro-Cathedral (Newark), Baptisms, marriages 1850-1885, 27 October 1872, Catherine McDermott. New Jersey marriage certificate C127, (12 April 1898), Bernard Conlon Jr and Catharine McDermott. New Jersey death certificate 036,701, (19 September 1955), Catherine Conlan. 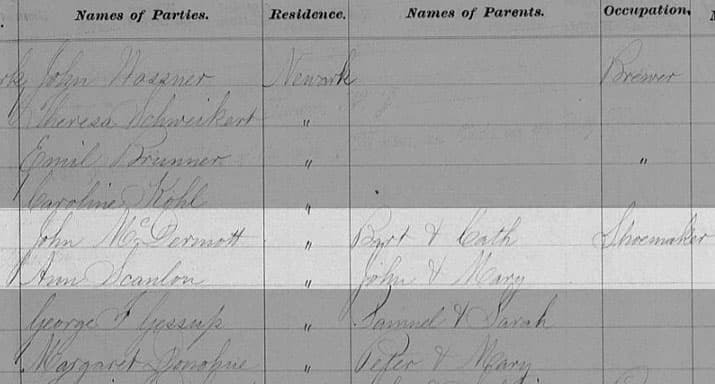 1880 U.S. census, New York City, population schedule, Manhattan, enumeration district 91, p. 20 (penned), dwelling 50, family 188, John McDermott; digital images, Ancestry.com (https://www.ancestry.com : accessed 28 January 2019); citing NARA microfilm T9, roll 871. 1900 U.S. Census, Newark, population schedule, Ward 15, enumeration district (ED) 0149, p. 269 (stamped), dwelling 64, family 109, Annie McDermitt; digital images, Ancestry.com (https://www.ancestry.com : accessed 29 January 2019); citing NARA microfilm publication T623; FHL microfilm 1,240,967. A. Stephen Holbrook, publisher, Holbrook’s Newark City Directory (Newark: n.p., 1870), p. 763. 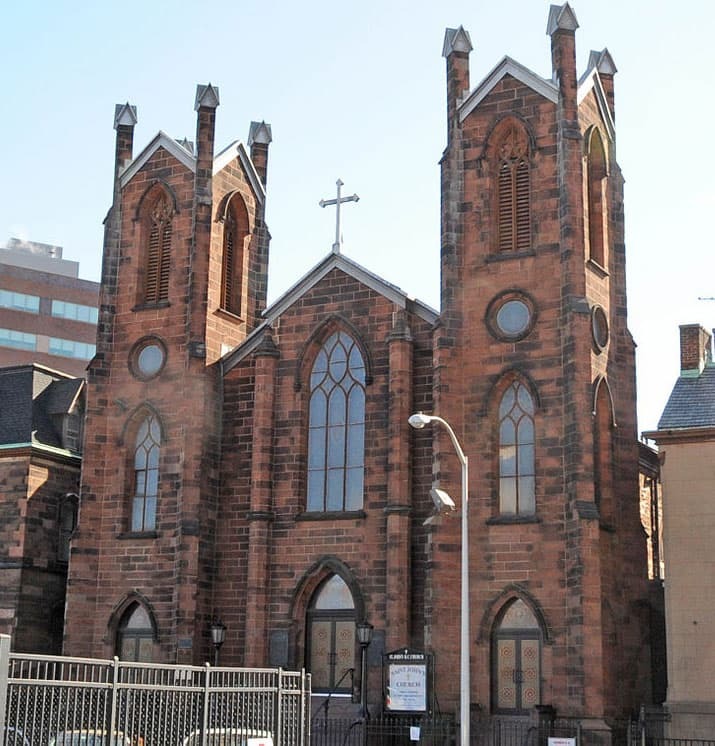 Saint John’s Catholic Church (Newark), Marriages 1832-1983, p. 138 (penned), McDermott and Scanlon; digital images, FamilySearch (https://www.familysearch.org/search/catalog/217302 : accessed 29 January 2019); citing FHL microfilm 1,398,540.